NIKOLA MIROTIC MVP? We discuss the meteoric rise of the Chicago Bulls and evaluate if their winning streak is perhaps ruining their future. In addition, we go more in-depth into the chaotic nature of the OKC Thunder. With the hype surrounding the team since its formation, its safe to say that thus far their performances have been underwhelming. As per the usual, the conversation deviates from basketball, this time towards discussing the turmoil that a one Jared Kushner is in. We eventually get to Lavar Ball and examine his Big Baller League idea. Whilst his antics and persona are not enjoyed by everyone, his ideas and holistic vision is something to appreciate. Much of his aspirations are reminiscent of a one Richard Branson. YES, I COMPARED LAVAR BALL TO SIR RICHARD BRANSON. This podcast as always is the typical randomised bunch of banter that you guys have enjoyed. We want to thank you for all your support during our infancy, its greatly appreciated and we hope you continue to be alongside throughout our journey in 2018. Bonus podcasts, facebook groups and generally more content are available by becoming a patron for as little as $1 per month. 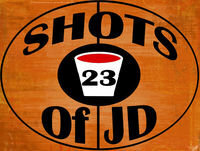 If you enjoy what we create and want to be apart of the 23 Shots of JD podcast community, make sure to subscribe to our Youtube channel.